Pure and Clean now specialise in the cleaning of Office Blocks and Apartment Blocks up to the height of 50ft. The 1st example is a 3 floor Apartment Block which is cleaned on a monthly basis for the management company, the internal communal windows are also cleaned. The 2nd example is a Mill which is cleaned on a Saturday as it is surrounded by car parking spaces and it is not safe to attempt to clean the windows on week-days,with all of the cars driving about. 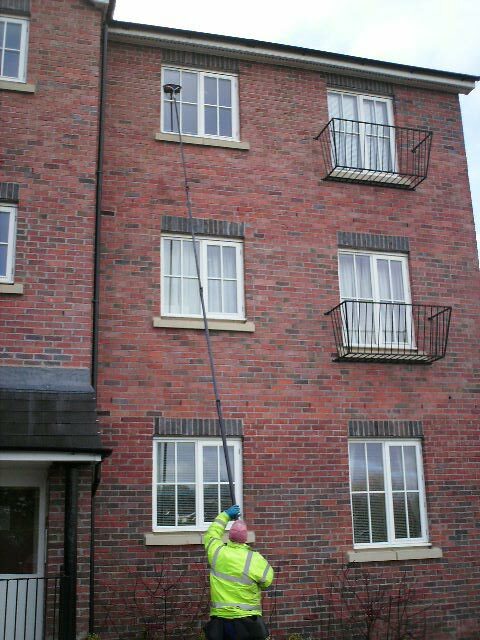 As the amount of Commercial Window cleaning work has grown, we have invested in Carbon-Fibre poles that reach to 50 Feet, enabling us to reach to 5th floors on most buildings, without the use of Window cleaning Access equipment. 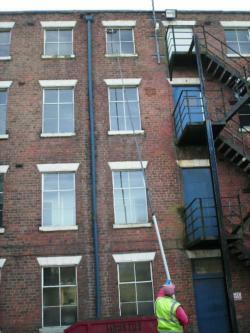 This enables us to provide an excellent Window cleaning service to our Commercial customers at an affordable price. As many of our clients now use internet banking, we have added a Paypal payment system to this site, most of our Commercial customers now pay by Bacs transfer.